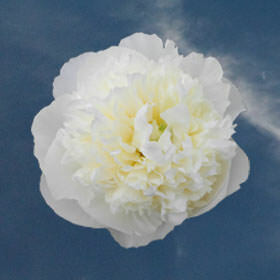 Divinely scented, White Peonies is a floret critically acclaimed for its voluptuous bloom. It can have a bloom as wide as 7 inches in diameter and a sweet smell that further adds to its charming disposition. In shades of cream that delight as much as decadent sweet, these blossoms sure a true treat. Showered with sun, their round figure is detailed by the dense inner petals that ruffle out and bring eye into their dance-like motion. One can entertain themselves quite easily observing their soft petals that turn from creamy white to yellow at the soft and delicate center. White Peonies as often been a popular choice for anniversaries to represent the continued success of marital union. Why not? They look like milk and honey, they communicate prosperity by simply looking at them. Their use in anniversaries does not preclude them in use for weddings, these glorious blooms tell of the good fortune ahead. Give these to an excited new-mother to further meditate the wonder of life. This peony is one of the most dramatic of flowers, like fluffy pillows, one can think of the opulence of a palace whilst in their presence. Having signed the covenant of excellent, you can make orders with full confidence that the freshest blossoms will arrive directly from our greenhouses to you. We guarantee you will be satisfied with your order, each bloom has been thoroughly checked for quality.